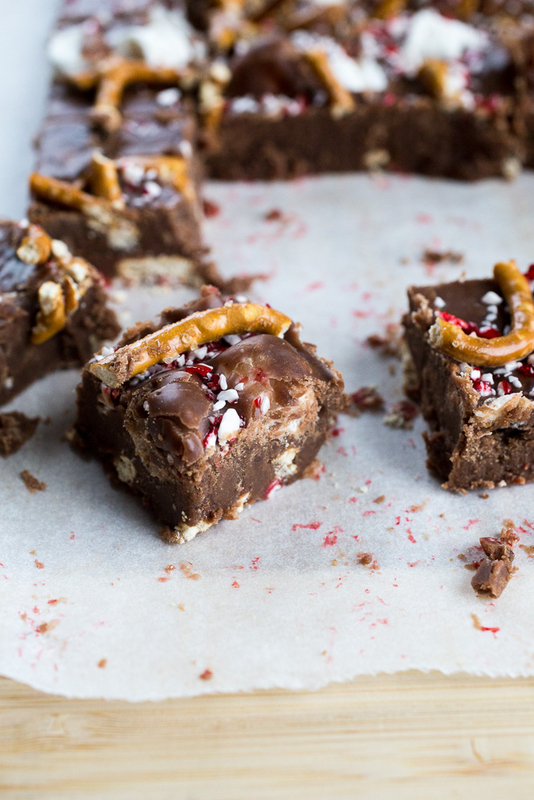 Peppermint pretzel marshmallow fudge – Super simple homemade Christmas fudge loaded up with crushed peppermints, sweet marshmallows, and salty pretzels. In the spirit of all things Christmas, these past few weeks have been a whirlwind filled with too much online shopping, too many cookies, and not nearly enough holiday music. It’s been a mishmosh of busy days at work and evenings spent decorating the house and watching our favorite Christmas movies (Christmas Vacation! The Grinch! Love Actually!). And this peppermint pretzel marshmallow fudge, likewise, is an outstanding mishmosh of some of my favorite things. This peppermint fudge recipe is dead simple to make. No, it isn’t as basic as microwaving sweetened condensed milk with chocolate chips (although, yum!). 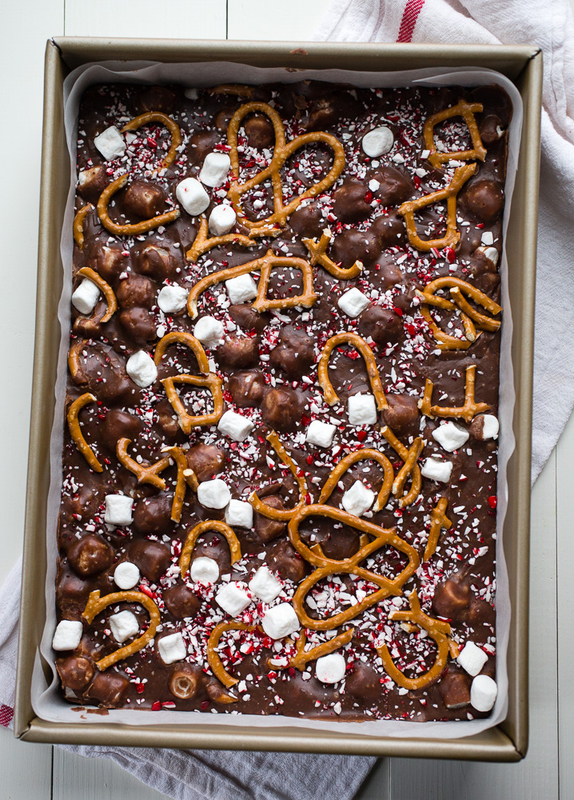 But the fudge itself is made with just a few pantry ingredients boiled on the stove top with the top and bottom layers covered with crushed peppermint candies, marshmallows, and skinny pretzels. It’s sweet, salty, minty, and oh so chocolaty all at the same time. And it pretty much got devoured when I put it out on my cookie platter last Christmas! Growing up, we never actually made fudge a part of our Christmas tradition. In fact, it wasn’t until I met Kyle that I had fudge at Christmas for the first time. His mom made her “famous fudge” (condensed milk and a bag of chocolate chips) and I seriously couldn’t get over how great it was! Since that first homemade fudge experience back in 2004, I’ve made a couple new varieties every few years with this cappuccino fudge version being the most popular. That was until I made this peppermint pretzel marshmallow fudge, of course! Because as much as I love love love anything coffee flavored, if you give me something with chocolate and peppermint, I’ll be your friend forever. Seriously! And so, with all of its minty, sweet, and saltiness, this peppermint fudge has become one of our Christmas traditions. Lightly spray a 9×13-inch baking pan with non-stick cooking spray. Line the bottom and sides with parchment paper and lightly grease the parchment paper. Sprinkle 1 cup of marshmallows, half of the peppermint candy, and half of the pretzel pieces over the bottom of the pan. Stir the butter, brown sugar, granulated sugar, corn syrup, half and half, and sea salt together in a medium saucepan over medium heat. Bring mixture to a boil and reduce heat to low. Allow the mixture to simmer for three minutes, stirring occasionally. Add the chocolate chips and stir until completely melted and combined. The mixture will still be simmering as you stir in the chocolate so be careful! Clip a candy thermometer to the edge of the pot and watch as the mixture comes to 234° F without stirring. Once the mixture reaches 234° F, take the pan off the heat and allow the mixture to cool for 10 minutes. Stir in the vanilla extract and ½ cup mini marshmallows to the still warm chocolate fudge. Using electric hand beaters (or use some elbow grease and a sturdy whisk), beat the mixture together until marshmallows are completely melted and combined, about 3 minutes. While the mixture is still warm, pour it over the marshmallows, peppermint, and pretzels in the prepared pan. 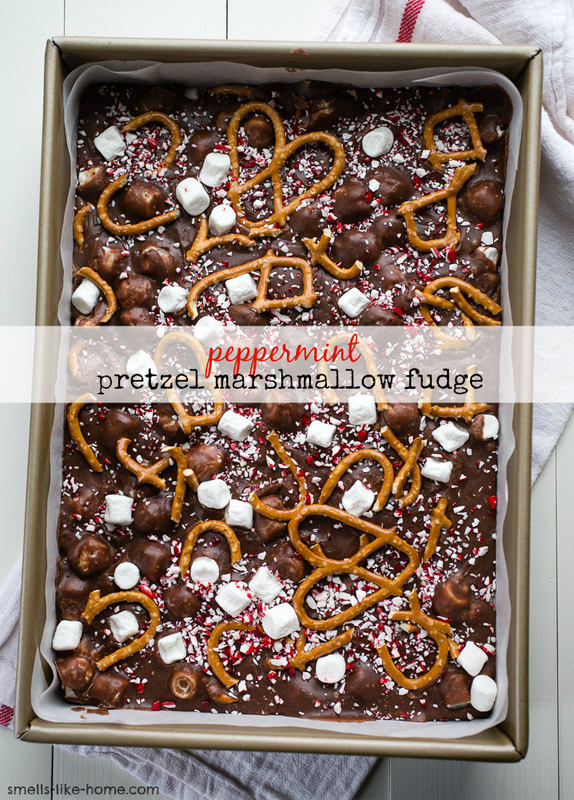 Immediately sprinkle the top of the fudge with the remaining marshmallows, peppermint, and pretzels. Press in just slightly while the fudge is still warm. Cover the pan in plastic wrap or foil and allow to rest in the refrigerator for at least 4 hours or until solid through. Once cooled, remove from the pan and slice into small cubes. Leftovers will keep at room temperature for about 1 week, in the fridge for a couple weeks, or in the freezer for up to 2 months. ooooh this fudge is so pretty! it’s def. the perfect gift!